News from "never 2 old to start cooking"
...which means that my daughter and I just got back from a great trip to London over the Thanksgiving holiday. England doesn't celebrate Thanksgiving as we do (our initial celebrants were running from England, as I recall), but London was in full swing getting ready for Christmas. One of the things I want to share with you is an easy, but decidedly yummy, take-away from Dinner by Heston Blumenthal. I'm also putting out a delicious alternative to pumpkin pie for those of you who OD'd on that holiday staple over Thanksgiving. 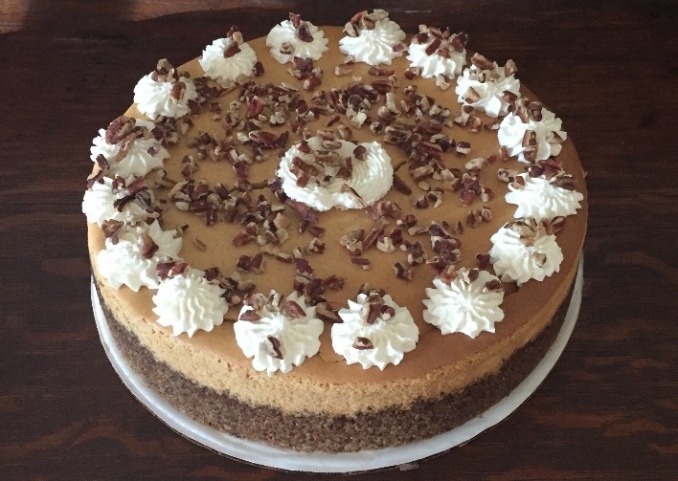 If you still like the idea of having that flavor sensation around for Christmas I'm spotlighting pumpkin cheesecake. Lastly I'm sharing with you a photo and limited commentary on one of the great dining experiences we had in London. 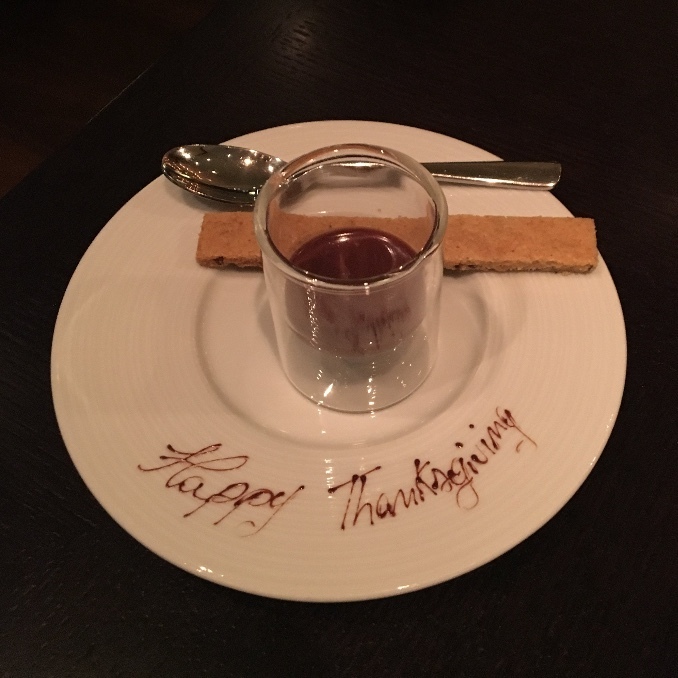 While England doesn't celebrate Thanksgiving, for the Americans dining at Heston Blumenthal's restaurant in London on what would be our Thanksgiving there was this added treat, compliments of the chef. My daughter and I were so taken by the savory combo of orange and caraway in the shortbread that I just had to try to duplicate it. A very easy and reasonable facsimile of the London original is posted here. As said, this is for those who want the taste of pumpkin pie, but like the idea of cheesecake as the medium for indulgence. And, as you can see, it can make for a really nice presentation with very little extra effort. The recipe is here. Ever considered celery as a dinner entree? 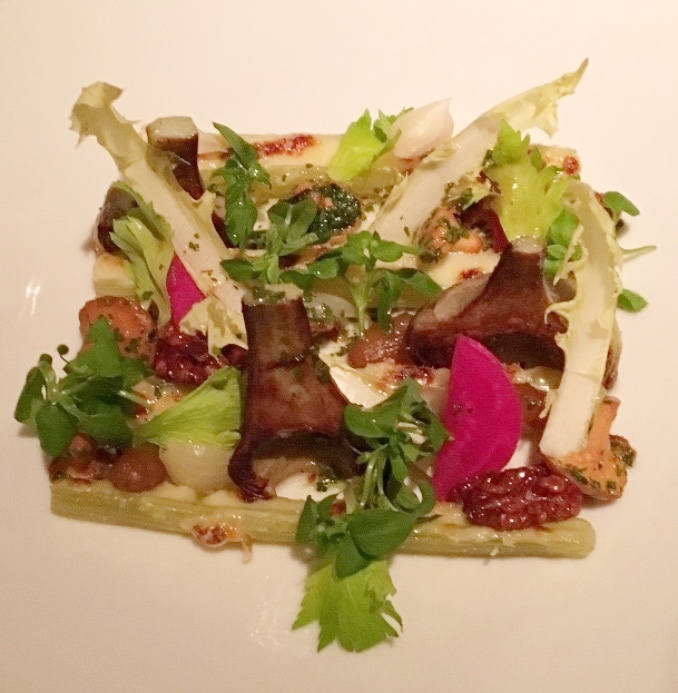 Me neither, but braised celery with Parmesan, girolles, cider apple, and candied walnuts, taken from a recipe dating from 1730, fills the bill. It's very tasty, and very light. It really leaves room for dessert. Don't believe it when you hear bad things about food in England. The menu at Dinner by Heston Blumenthal contains source information for the various offerings. Coincidentally (or maybe it says something about my mindset), all of the items I ordered came from the same cook's book published in 1730. I don't feel nearly that old!!! Copyright © 2016 never 2 old to start cooking, All rights reserved.